Illumination can make or break an inspection system, and this is especially true for surface inspection, whether that surface is highly reflective or transparent. In the latter case, defects can be brought out in glass with brightfield or darkfield illumination, depending on the defect, but since only around 4 per cent of the light is reflected from a glass surface, both the lighting and the sensitivity of the camera are critical for inspecting the material, according to Dr Britta Niederjohann, a product manager at camera manufacturer Basler. Basler has provided vision solutions for display glass inspection and colour filter inspection, checking for defects both on the surface and within the glass itself. In its most recent display glass inspection system, Basler used more than 100 line scan cameras at 4k resolution. ‘A display glass sheet is around 2 metres wide, so we attach multiple cameras in one line and every camera only images a certain portion of the glass,’ explained Niederjohann. Most float glass is inspected by moving the sheet under a bank of line scan cameras that check for inclusions, cracks, air bubbles, and deformations. Bottle and ampoule inspection can also use line scan cameras, in this case by rotating the container in front of the camera to inspect for defects. This is cold glass inspection, but there is a step prior to this immediately after it comes out of the mould or after it has been floated into a sheet when the glass is still hot, where an infrared camera can be used to pick out defects. The viscous molten glass is piped to a production machine. A blade then cuts the correct amount of material from the feeder, Stevens explained, which then fills the mould to form the bottle. If there is too little or too much glass, the bottle won’t form completely or molten glass will spill out onto the production machine. The illumination used will depend on the type of defects. Polarised light, for instance, can be used to check for strain in the glass; particles fused to the surface can be seen with brightfield illumination from the reflected light, while scratches are more apparent using darkfield illumination, whereby the indirect, scattered light from the defect is imaged. Niederjohann commented that the systems Basler produces range in resolution from 10µm up to 50µm per pixel, depending on what the glass will be used for; the specifications for thin film solar cell glass are much lower than for display glass, for instance. It will depend on factors like sensitivity and frame rate as to the number of cameras needed to cover each sheet of glass at the desired resolution. Basler has also developed an algorithm to determine which side of the glass a defect is positioned, based on whether the defect casts a shadow – a defect on the front side will throw a shadow onto the back side; a defect on the back will not. Not all glass inspection involves line scan systems checking large sheets of material. EVT Eye Vision Technology, based in Karlsruhe, Germany, has developed a system for a Japanese company manufacturing glass wafers. The process starts with a glass wafer onto which different substrates are applied. In between each application, the wafer has to be inspected for faults like dirt on the wafer, or stripes or blobs created when applying the substrate. The defects are then characterised and a report generated detailing whether the wafer should be rejected or not. ‘We have a complete list of the defects from the manufacturer,’ said Michael Beising, CEO of EVT. ‘We have a lot of classifications for this, which were entered into the software to determine whether the defects are outside of the tolerances for an acceptable wafer.’ The data is then sent back to a PC controlling actuators in the production machine. The system is based on the Matrix Vision MvBlueLynx-X smart camera running EVT’s EyeVision software toolkit. The wafer is backlit to pick out the defects. At the end of the process a silicon substrate is placed on the glass. ‘One of the tasks was to find a backlight with the right wavelength to get the contrast out of the image,’ explained Beising, which turned out to be in the red area of the visible spectrum. ‘It took a while to find the correct combination of LEDs to generate the necessary wavelength,’ he added. 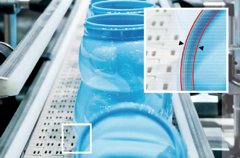 The line scan systems for display glass inspection typically require high-speed interfaces and fast data processing to achieve the production speeds necessary. Basler uses Camera Link cameras, although Niederjohann said that more line scan applications now use Gigabit Ethernet interfaces to avoid having to use expensive frame grabbers. 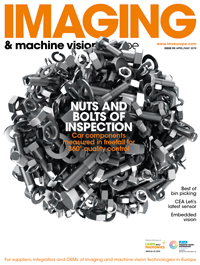 IDS Imaging Development Systems now supplies a variant of its USB 3.0 uEye CP area scan camera with triggered line scan modes, which Steve Hearn at IDS said is an affordable alternative to line scan cameras for glass inspection applications. The camera model can run a 2k line at more than 10kHz, for example, noted Hearn, as well as operating multiple lines in potentially up to eight positions. Line scan cameras can be expensive, and Hearn said that these area scan models offer ‘low-cost and flexible line scan capabilities’. He added: ‘There is a lot more flexibility with using area scan devices.’ The cameras can be used to inspect and process two areas separately. ‘The limits to an inspection system include how fast the cameras operate, what kind of resolution is needed, and how fast the data can be processed onboard the frame grabber,’ Niederjohann noted. The lighting used impacts primarily the first of these limitations and Niederjohann commented that Basler typically uses high-power LEDs, either as a rack in a straight line or projecting the light onto the glass through fibre optics. And, she added, with a high enough resolution, defect features like size and form can be determined and the system can make a classification of the fault.